Want to know all about the latest research in human resource development? 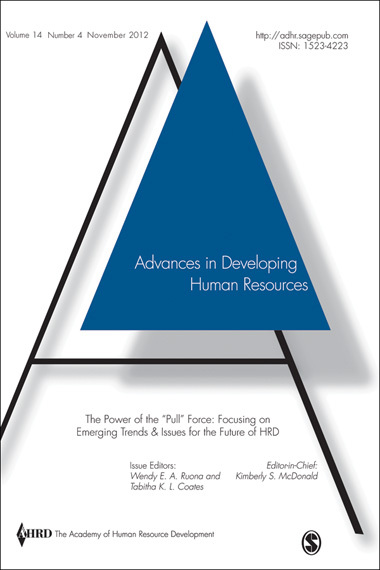 Take a look at the top five most read articles from Advances in Developing Human Resources! This journal explores problems and solutions in an organizational setting and discusses concepts for the future allowing scholars and practitioners to work more effectively in human resource development. These articles are free for you to read for the next 30 days. Want to know about all the latest news and research like this from Advances in Developing Human Resources? Click here to sign up for e-alerts! The latest most-read articles from Business Communication Quarterly cover topics including crisis communication, workplace interpersonal skills, employee engagement and well-being, and more. The articles are free to access through the end of May using the links below. Please share and enjoy! Stay updated on the latest research in the field of business communication: subscribe to BCQ’s RSS feed, and click here to receive e-alerts about new articles and issues published online before they’re in print. What keeps tourists coming back? How do the locals respond to tourism development? Can travel professionals positively affect society while pursuing their profits? These and more are among the topics covered in the current top-read articles in the Journal of Travel Research (JTR), providing up-to-date, high quality research on behavioral trends and management theory for one of the most influential and dynamic industries. These papers are freely available to access using the links below through May 4. Please share and enjoy! Stay abreast of the latest travel industry trends: subscribe to JTR’s RSS feed, and click here to receive e-alerts about new articles and issues published online before they’re in print.